Twenty-year-old Valerie Kittridge is horrified to learn that her father has had a stroke. As an only child and with her mother dead, her father is all she has in the world, and she leaves her life as a film student in California to nurse her father back to health. On her wild, late-night car ride to Duerme, the small town in New Mexico where her father lives with his girlfriend, she is besieged with a host of strange and terrifying dark omens and flashbacks to her childhood. For there is something waiting for Valerie at Duerme, not just her stricken father, but an irresistable stranger who had saved her life many years ago–the man of her dreams. In Witch-Light, Nancy Holder and Melanie Tem collaborate on the second of their fascinating demon-lover stories. The first one, Making Love, was a sensual variation on the Frankenstein theme. Witch-Light is the mesmerizing story of a dark, mysterious, devastatingly handsome man named Gabriel, a bruja, or male witch, who draws Valerie into a twisted romance that will take her to the very edge of love and obsession. 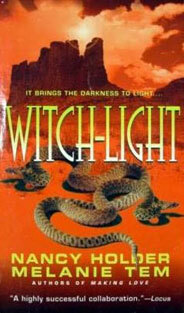 Full of the magic and mystery of the Southwest, Witch-Light is a bittersweet, compelling mix of romance, horror and fantasy, a dark journey into a strange and wonderful world of folk magic, superstition, and obsessive love that knows no bounds.